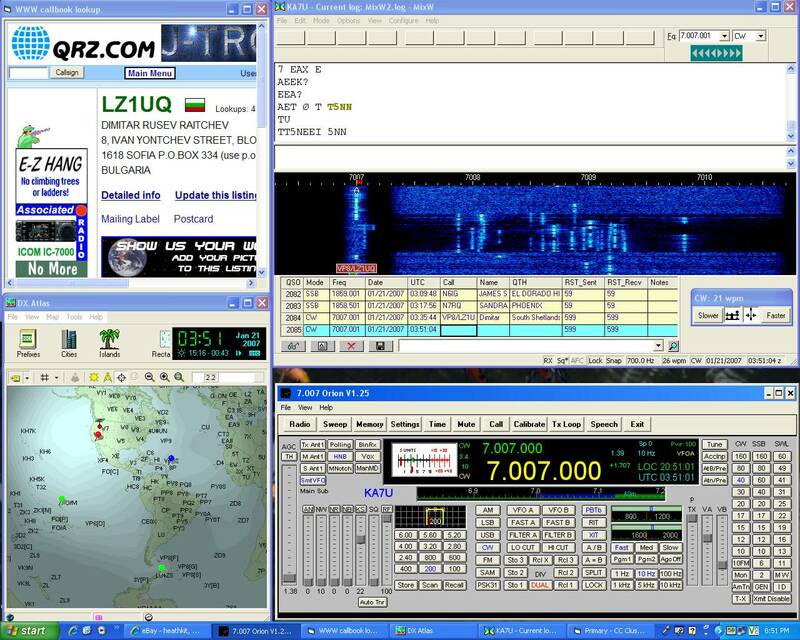 The image below is a screen shot showing the typical setup at KA7U working CW. I use Carl Moreschi's N4PY software to control my ORION II. Carl is continually improving this software and for my use it is excellent! You can read my modest review of it here http://ka7u.us/n4py.htm . In coordination with the N4PY ORION control software I use MixW for a digital mode generator and log book. MixW has many macro functions that facilitate S&P and visual tuning. It is a great software for my use. A plug-in program Mix Web Lookup 3 gets the call sign entered in the log book and lets you search for it on the major call sign data bases, (QRZ.com just happens to be the one currently shown). The RASCAL interface is used here to connect the ORION II AUX jack to the computer serial port and sound card. This is a low cost and convenient way to interface the radio to the computer and MixW can be configured to use Pegasus / Jupiter (emulation) and still key the ORION II using CAT command. This provides MixW keyboard and macro sending for CW as well as digital modes. A standard serial cable is used to connect the serial jack on the back of the ORION II to a serial port on the computer and the N4PY ORION control software is configured to use this port to control and key the ORION II. N4PY keyboard and transmitter keying is therefore also available. With a key connected to the Key jack on the front of the ORION II the rig can be manually keyed for PTT and CW concurrent with CAT control! So it all works and plays well together configured using two serial ports and two software packages communicating with each other through the pegasus.in transfer file specification. HamCap, DX Atlas, and IonoProbe are all active in this session as well, although only the DX Atlas window is displayed. These programs seem to be very good at predicting path openings and provide an excellent visual reference to what can be expected for radio wave propagation from point A to point B. I really enjoy using them. N4PY (through a free separate program), and MixW provide for a DX Cluster and Telenet service that integrates with the program and will set the ORION II frequency to the station and even the split if selected, but I find the full features of the wonderful VE7CC software, CC Cluster, to be a preferred solution here. It is not automatic, I have to enter the frequency data, but still what a great program to run concurrently with CAT software. As you might notice, I am having a lot of fun.